Keeping the lights on during a power outage is usually the selling point of a microgrid. But a new report by Rocky Mountain Institute (RMI) breaks down the 13 value streams that battery storage can provide, and at least ten of them can be delivered by microgrids. It’s a reminder that grid-tied microgrids have much more to offer than resiliency, especially microgrids with battery banks. These services offer real value, can be stacked, and could flip the economics in favor of microgrids. Below are the potential revenue streams that microgrids can feasibly be compensated for. The services are categorized by which stakeholder receives the most benefit. The wholesale cost of energy is increasingly volatile. Microgrid battery systems can exploit this by loading up on cheap cheap energy at night when only the least expensive baseline generators are operating. 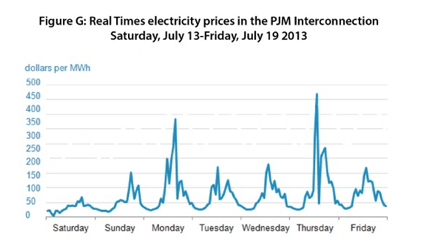 During peak periods, around 3-7pm, grid operators pay power generators a large premium to meet increased demand. Barrier: Microgrid needs to be able to participate in wholesale markets. Microgrids don’t always have access to wholesale markets. The grid requires power supply to be perfectly aligned with demand at all times. This requires a generation source with an immediate and automatic power response to changes to demand on a moment-to-moment basis. Frequency regulation maintains the quality and reliability of the grid. Grid operators know that power generators will occasionally fail, so they prepare with backup generators that are ready to go. Spinning reserves are ready to go immediately while non-spinning reserves require a short period of time. In addition to extra battery capacity, a microgrid may have a backup generator that can serve this role. Microgrids can be valuable for helping the bulk grid restore power after a power outage. After shutting down, most large generators need outside electricity to restore their operations. Microgrids can use excess capacity, or temporarily dedicate everything for that purpose. Microgrids can be built in areas where the grid is having trouble meeting demand. Instead of investing in more large scale generators, it may be beneficial to reduce demand by putting certain areas on their own microgrids. Microgrids that contain distributed resources such as solar PV, microturbines, battery storage can delay or eliminate the need for upgrading distribution system upgrades. ISOs (independent service operators) charge high fees to utilities for using congested transmission corridors during certain times of the day. Microgrids deployed downstream of the corridor and potentially supply additional power to the grid during those periods. 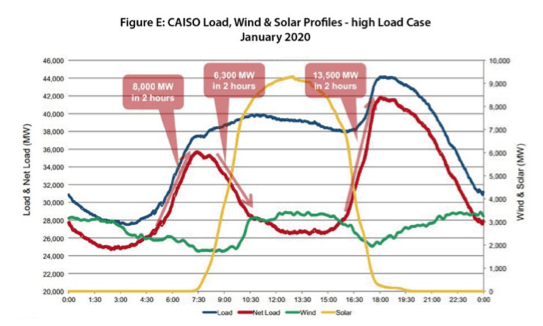 Congested transmission corridors can delay or eliminate the need for upgrades by deploying microgrids at strategic locations downstream of the congestion. When penetration levels rise, the value of solar energy decreases to the grid. Microgrids can fully utilize solar PV with an appropriately sized battery bank. In fact, solar PV with an adequate battery bank alone is able to participate in nearly every potential value stream. Keeping the lights on during power outages is usually the primary purpose for having a microgrid. Keeping businesses open, hospitals running, and critical infrastructure maintained during power outages has tremendous economic and social value. Of course, if the primary purpose of a microgrid is to provide uninterruptible power during power blackouts, that may limit the extent they are able to participate in other value streams. For instance, microgrids probably do not want to sell themselves as spinning/non-spinning reserves because that would require them to dedicate a large portion of their capacity if the grid needs it. Still, many of the value streams do not drain the capacity of the microgrid, and offer potential for microgrids to stack value and significantly impact the economics of a microgrid. There are many regulatory barriers that could prevent microgrids from providing their potential value. The biggest impediment is that batteries are often not given an equal playing field with large central generators. Additionally, if an asset provides value to multiple stakeholders, regulation currently makes it difficult or impossible for the utility to be compensated. Regulations often make it difficult or impossible for a utility to collect revenue from a behind-the-meter energy storage asset. Microgrid value is determined on regulation allowing fair access to markets.